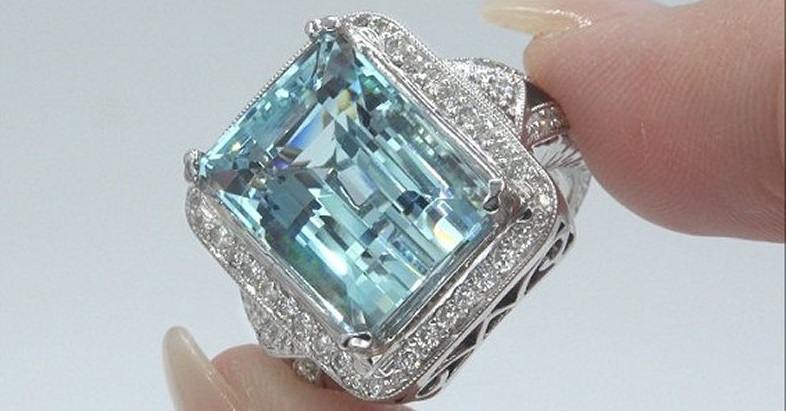 A Gorgeous GIA Certified 14.45 Carat Natural Aquamarine & Diamond Estate Ring. 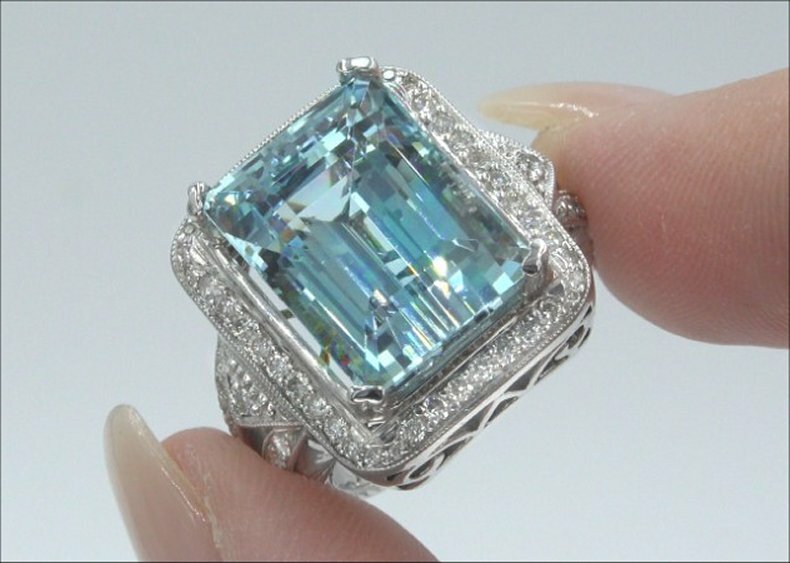 This Absolutely Colossal Natural Aquamarine features INTERNALLY FLAWLESS clarity with a rich and stunning single hue Blue color. This jaw dropping estate treasure features a solid 14k white gold setting that is elegantly set with an impressive 64 GIA evaluated diamonds with VS1-SI2 clarity and colorless to near colorless F-G color, accenting this eye caching custom made designer estate ring. GIA CERTIFIED 14.45 Carat Engagement – Anniversary – Cocktail Estate Ring featuring an Extremely Rare Internally Flawless Clarity Natural Aquamarine set into SOLID 14k White Gold and accented with sparkling diamonds. 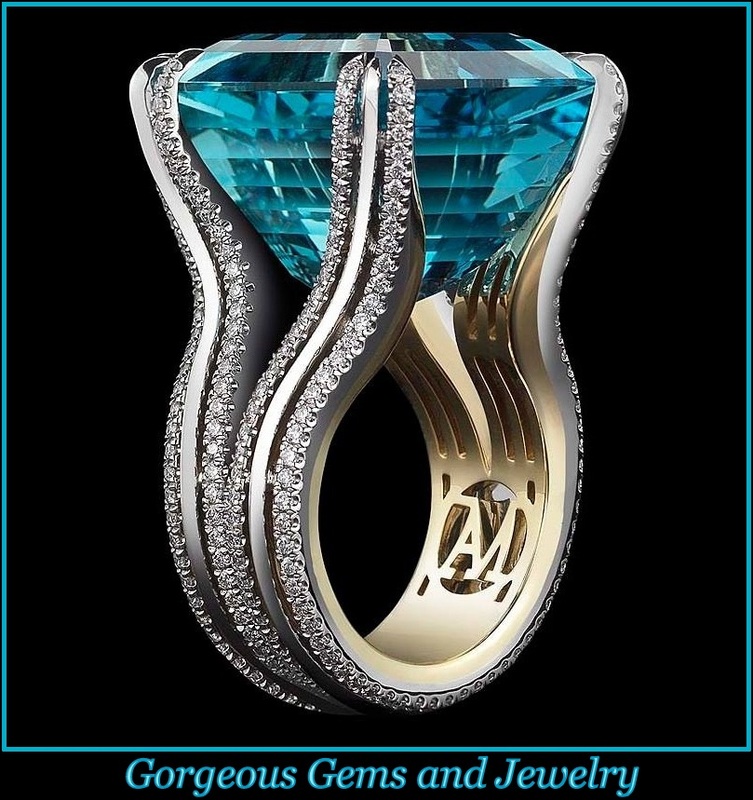 The “Jaw Dropping” Aquamarine measures 15.40 x 11.88 x 9.94 mm with the highly sought after EXOTIC Single Hue Blue Color and an Octagonal Brilliant Cut weighing an EYE POPPING 13.66 carats (exact carat weight). There is also a total of 64 natural untreated accent diamonds (round brilliant) totaling an additional 0.79 carats set with the Aquamarine in a classic style. These “Perfectly Clear” diamonds are graded at Near Flawless to Eye Clean “VS1-SI2” Clarity with COLORLESS & NEAR COLORLESS “F-G” Color so you can be assured of the OUTSTANDING quality, excellent brilliance, flash, sparkle & fire. The diamonds were also evaluated by GIA and a Diamond Assurance Report is included confirming the authenticity of the diamonds. The ring measures 20.20 mm x 17.85 mm at the head and sits up 11.95 mm off the finger. The gemstone and diamonds were recently evaluated by GIA (Gemstone Report# 5182154540 & GIA Diamond Assurance Report# 1186154545). All of the beautiful gemstones are 100% genuine totaling a very substantial 14.45 carats and the ring is a U.S. sizable 6.50+. The total ring weighs a HEAVY strong & sturdy 13.75 grams and is constructed of solid 14k White Gold with exceptional PRIME QUALITY natural gems.